I thought I heard there was going to be a remake (you know, in a perfect world I'd lose you all at the word "remake") of the original HELLRAISER, as if anybody thought the paranormal gore classic didn't go far enough. HELLBOUND? isn't part of the franchise relaunch, sorry, but rather a documentary from Kevin Miller about a concept key to the Clive Barker horror blockbuster - hell - and a segment of the population who I suspect flocked to see HELLRAISER, its first sequel HELLRAISER 2: HELLBOUND, etc. etc. more than they'd care to admit: devout Christians. I must have missed it - perhaps I can plead ignorance due to possession by Harry Potter novels - but not so long ago a "megachurch" pastor named Rob Bell riled up the evangelical community with a book entitled Love Wins. In its pages he apparently sets out to prove that God loves everybody and cares for everybody and wants the best for everybody (now a wicked film critic would insert "except Cleveland sports fans" here; good thing I'm not wicked). As a consequence, Bell thus proposes that under a benign Creator there is no such thing as eternal damnation in hell. This horrible Good News apparently scared the bejesus out of conservative Protestants, and Bell's book got him ranked right down there with J.K. Rowling. Furthermore, Robert Young's best-selling Christian novel The Shack (about a grieving dad confronting the entire Holy Trinity about the murder of his daughter and the nature of evil in the world) also apparently got crucified by the conservatives, as it suggests that salvation is possible even for child-killers. I actually did read The Shack and had no idea it was considered blasphemous in some quarters. Some holy rollers just can't seem to live without hell in their hearts, ironically. 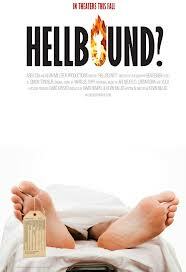 This theological controversy underlies filmmaker Kevin Miller's HELLBOUND?, which worked for me more like a discussion tool than great cinema, though one appreciates the pilgrimage undertaken by the filmmaker, inquiring of a variety of clergy and theologians about the nature of hell, why a loving God would deploy it - and who is trapped forever down there? Such popular villains as Saddam Hussein, Osama bin Laden and Adolph Hitler? Or relatively minor sinners as well? And can't any of them get paroled or something? All worthy questions - that have lately inspired some pretty juvenile Nicolas Cage occult actioners I’d rather not mention. Interviewees in HELLBOUND? include "exorcist" Bob Larsen - an anti-rock-and-roll crusader whose preaching is gleefully sampled on college radio - a number of authors in the religion biz and seminaries; David Bruce of the pop-culture website Hollywoodjesus.com; and a bunch of megachurch pastors. It speaks well of Miller's approach that he generally gets rational-sounding statements from these believers up front - before showing them in their cartoonish personas, preaching and ranting like Elmer Gantry before their congregations. At a 9/11 memorial service Miller even gets something almost approaching a dialogue with the loathsome Phelps family from the Westboro Baptist Church, who are in Manhattan to condemn homosexuals and celebrate the Gulf War and WTC casualties. They gleefully believe in hell and assure the filmmaker that something like 99.999999999 per cent of humanity are going there (which puts them in accord with the most recent TOXIC AVENGER movie, remarkably). Not surprisingly, the controversy mostly splits into Red State-Blue State lines. The religious conservatives are all in favor of "everlasting conscious torment" as Gospel truth, as certain as Baghdad had WMDs. Meanwhile more liberal-minded preachers and scholars and proponents of "universalism" raise some inconvenient truths about the origins of the Old Testament (the Jewish traditions from which they derive hardly speak of hell at all) and the way the church authorities distorted the original Jewish depiction of Satan over the centuries, from a sort of divine prosecuting attorney, to a rebel angel, to a Darth Vader antichrist (and it might be remembered that even Darth Vader got Saved in the end). I was disappointed that Miller didn't get input from a handful of evangelical-author types who claim, via near-death-experiences, to have actually visited hell and lived to tell about it. Nor does he go far outside Protestant tradition to hear what the Mormons and the Buddhists and the Muslims and the - horrors - Catholics - have to testify, hell-wise. He DOES go to some black-metal rock concerts, where musicians from Deicide and Morbid Angel affirm their demonic affiliations, but not in any useful or thoughtful way (and no visit to the Church of Satan, who are basically atheists anyway). While there is some animation, Miller never attempts anything on the visual level that Diane Keaton achieved in her whimsical nonfiction feature HEAVEN, using campy old movie clips from a variety of sources to illustrate the afterlife. One doesn't have to be in the Westboro Baptist Church to see that the filmmaker has his own biases, basically favoring interviewee Frank Schaeffer (author of Crazy For God), a broadminded evangelical who drags Zionist offenses against the Palestinians into the mix (whole other bunch of devils there) and says "There are no good guys and bad guys; we're all in the same fix." That cosmology is pretty comforting to us sinners, yes - but also rather suspiciously the type of warm, fuzzy, feelgood spirituality and moral relativism that most audience focus-groups would want to hear. What stuck with me instead was early input from one very surprising proponent of hell: Hollywood scriptwriter and instructor Robert McKee, a staunch atheist.